Allvor is the first cryptocurrency issued in the XRP Ledger with a focus on e-commerce. Allvor proposes integrating the XRP Ledger’s superior technology with systems and protocols used in e-commerce as a way to boost the cryptocurrency use on a global scale. The XRP Ledger, which is developed by Ripple Company, is the best and most efficient distributed database technology ever made. In the next years, the best and most consistent blockchain technologies will transparently integrate and operate with the various layers and protocols required to conduct financial and business transactions. The Allvor Project will be focused on developing and encouraging the development of such integrations in order to promote the widespread use of the ALV token along with the systems that support the trade of products and services, ranging from small virtual stores to large e-commerce players. 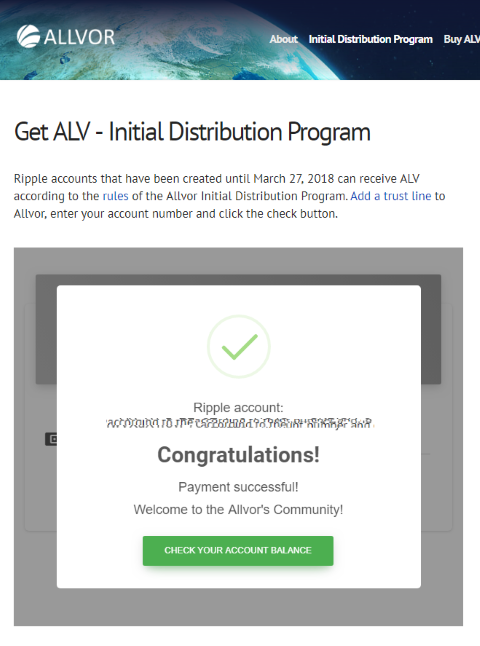 The ALV token is stored in a Ripple account, along with XRP. Users can manage their balance, send payments and trade ALV by using the same Ripple wallet they use to store, send payments and trade XRP. The Allvor initial offer will be free and for the community. 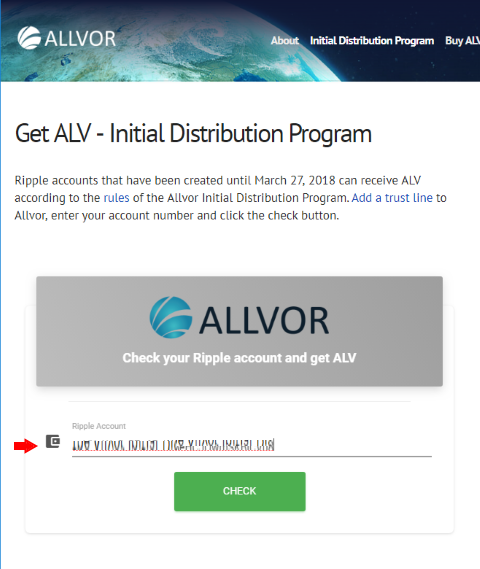 The initial circulation of ALV will be performed through the free distribution to Ripple accounts created until March 27, 2018. 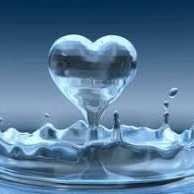 If your Ripple account was active on this date, you may receive ALV through this Program. 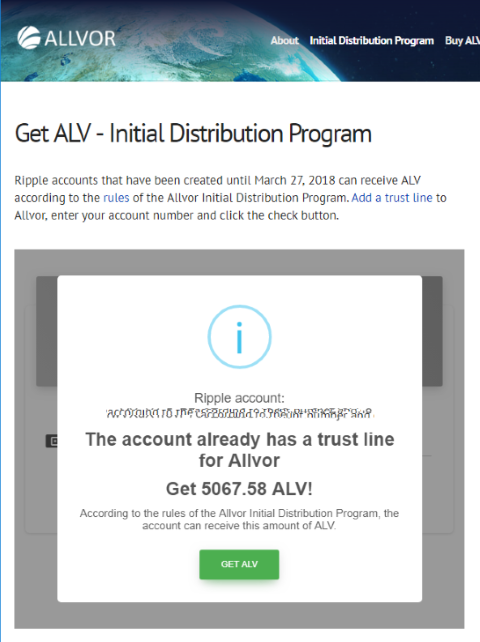 The amount of ALV to be received corresponds to the amount of XRP available in the user’s Ripple account at 01:00 (GMT 00) on March 28, 2018, (Ledger 37539810), with an increase of 30%, added to the standard amount of 5,000 ALV. ALV will be progressively included in the main cryptocurrency exchanges. 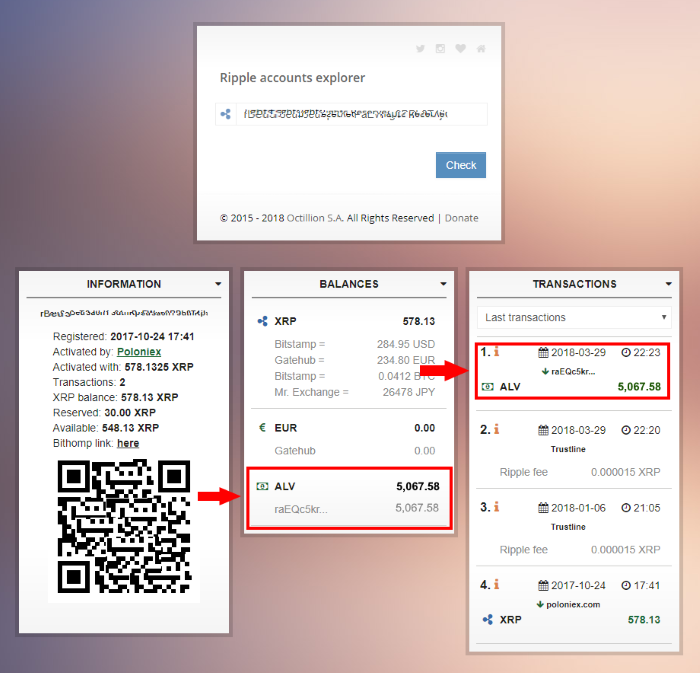 Nevertheless, at launch, it is already possible to buy and sell ALV by using the XRP Ledger’s decentralized exchange platform, using XRP to buy ALV. So, to buy ALV, the user must have an active Ripple account, add a trust line for ALV, use a wallet that allows them to create and execute purchase/sale orders on the XRP Ledger and have some XRP to make their purchase or bid. If the user does not have a Ripple account, they should use one of the available wallets, create an account and buy some XRP first. The ALV tokens have already been fully issued and are not subject to mining. The complete issuance has 100,000,000,000 ALV. The projected Allvor distribution considers up to 5% of distribution at release, including our Initial Distribution Program, Marketing, and Dissemination, among other actions. ALV will gradually enter into circulation, according to the demands of the project, and the forecast is that it will only reach full circulation by 2030. As part of its efforts to ensure the reliability and transparency of the XRP Ledger transactions, Ripple Company has developed and maintains XRP Charts. All transactions in ALV are publicly registered and are accessible for consultation on the network, in the same way as it happens with transactions in XRP. You can access XRP Charts to search and check all ALV transactions. 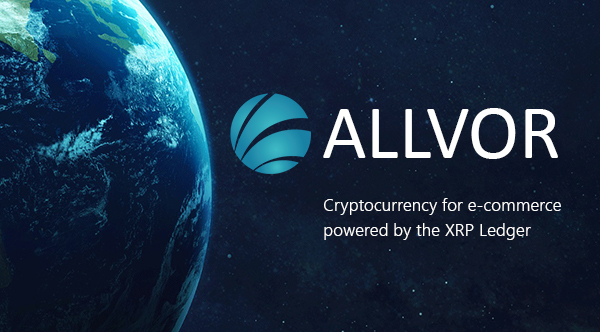 Allvor will soon develop a specific ALV transaction consultation channel, which can be used in conjunction with the Ripple Charts information, but exclusively showing the ALV-related transactions. Note: The Allvor Project is an independent initiative, which has no support or sponsorship from Ripple Company. The XRP Chat is an important source of information and knowledge for us. We would like to go on record and acknowledge and say thank you to Karlos, Hodor, Joel kratz, gtGox, Tehol_Beddict, mars75, RegalChicken, PickleRick, Hodlezerper, Mercury, PFTQ, JonHolmquist, Nikk, The_Phoenixed_Banker and all other developers, visionaries and entrepreneurs who offer us their knowledge and experience daily in the XRPchat. Why would I use your token instead of XRP? @karlos @Hodor could you give us your thoughts on this please. I had a look, but still don't see it. Maybe I'm missing it. Why would I use Allvor for purchasing and selling goods instead of XRP? What are the benefits? "For e-commerce, the scenario is similar. No integration solutions have yet been presented between the XRP Ledger and the platforms that support e-commerce operations. Of course, the company is already aware of this, and over the coming months and years, it will present solutions and partnerships in this sector. Ripple is expected to develop partnerships with major players, such as Amazon, Alipay or Apple Pay, among others. Such partnerships represent billions of dollars in business relationships, whose negotiations can take months, not to mention the resolution of regulatory issues, which in most countries is not settled yet. 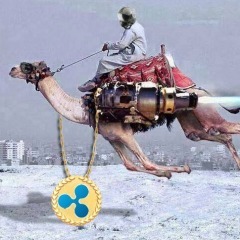 In addition, the banking and international payment issue is so huge and its success will be so rewarding that Ripple does not see retail as a priority so far. In any case, the commercial payments market is so fragmented that there are several strategies to expand the use of the XRP Ledger in the sector. What Allvor proposes is a strategy to speed up the use of the ALV token and the XRP Ledger in e-commerce. Having good plugins for Magento and WooCommerce in place, developing partnerships for innovation with companies and having some operating debit cards are necessary. It is also necessary to draw the attention of the community of independent and innovative developers for the potential uses of the XRP Ledger, including the numerous FinTechs that have emerged recently, which already see payments from an innovative point of view. These startups, unlike banks, do not need to get convinced about the blockchain technology’s potential. They need support, encouragement, and an active community around innovative projects. Allvor will support these companies and foster the innovation ecosystem in digital payments with ALV towards the XRP Ledger." Your white paper reads like an opinion piece. So why would these newly developed plugins/connectors utilize a token different than the native one of the XRPL? 3. The application queries if the trust line is ok. Click to get paid. So then you can convert this free alv into xrp? Thanks for flagging me down! Here's what I support without question: ICOs done on the XRPL. As long as they are legit ICOs, and conform to regulations, they should be done on the XRPL. It's faster than Ethereum, and more scalable. It will also bring additional liquidity. Some might see this as a possible competitor to the XRP as a native asset, but I don't see it that way. Think of EOS for Ethereum. Or any ERC-20 token, for that matter. They don't dilute Ethereum - they bring great amounts of liquidity. Probably the sole driver behind Ethereum's demand levels is it's hosting of ICOs. Let's support these on the XRP Ledger (as long as they're legit). On to the next question: What about this particular ICO? I sped-read through their whitepaper, and it looks just as legit as the other various whitepapers I've read. I'd have to learn a bit more about it before making any kind of informed recommendation one way or the other. Kudos to the team for having the courage to post here first, regardless of the outcome. Thank you Hodor, your opinion is important to us. I sped-read through their whitepaper, and it looks just as legit as the other various whitepapers I've read. I'd have to learn a bit more about it before making any kind of informed recommendation one way or the other.